Personalised Keyring - Light Wood, Gifts, Weddings, Father's Day, Christmas, Valentine, Birthday, Bachelor Party, Graduation. Make your purchase extra special by ordering a custom-made/personalised keyring. You can add any name you choose. 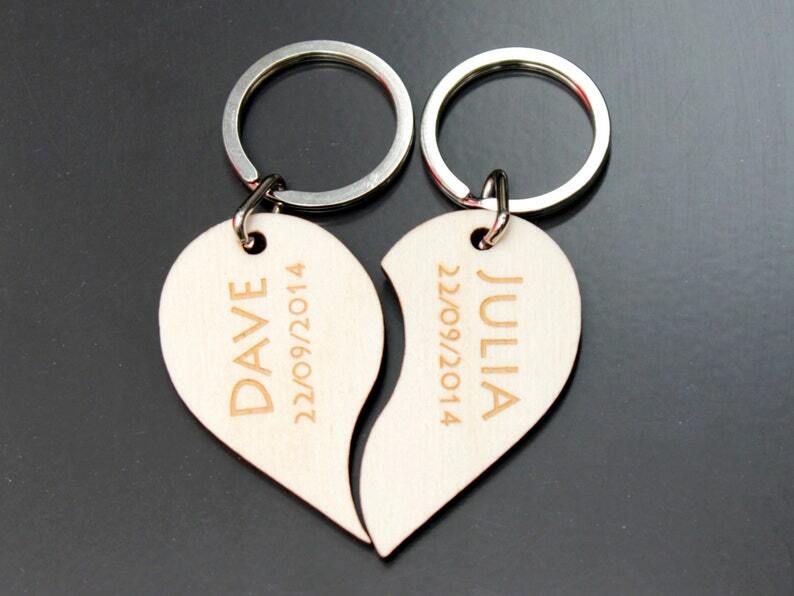 Our personalised keyrings are handcrafted from high quality hardwood. Lightweight and durable, this wood is manufactured from premium quality timber and is planed and treated on all sides. Can't find what you are looking for? We can make ANY design to order! For custom made orders, click 'Request custom item' on our Etsy homepage. At the time of check out please provide me with the names and dates you would like for the engraving. The Keyring will be made in the order of the names and dates you list in the comment section at check out. Please contact me for discounts on 5 or more items! All items are custom made and we do not provide exchanges or refunds. If there is an issue with shipping we will replace the item upon notice and pictures of the issue. Note: Please provide names you would like engraved on each pieces upon check out. Personalised Keyring - Dark Wood, Gifts, Weddings, Father's Day, Christmas, Valentine, Birthday, Bachelor Party, Graduation. Personalised Puzzle Keyring - Pink & Blue. Gifts, Weddings, Father's Day, Christmas, Valentine, Birthday, Bachelor Party, Graduation. Personalised Puzzle Keyring - 2 Colour Engravable Plastic. Gifts, Weddings, Father's Day, Christmas, Valentine, Birthday, Bachelor Party. Personalised Puzzle Keyring - 5mm Acrylic, Gifts, Weddings, Father's Day, Christmas, Valentine, Birthday, Bachelor Party, Graduation. Save The Date Tags - 600gsm Thick Card / Gift Tags / Wedding Tags / Paper Tags / Luggage Tags / Personalize Tags / Birthday / Anniversary. Thank you so much for all your hard work.. I am completely in love with your work. 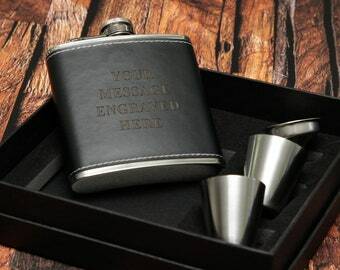 Personalised Black Leather Style Hip Flask Funnel Cup Gift Set - Wedding, Stag, Dad Him ! !